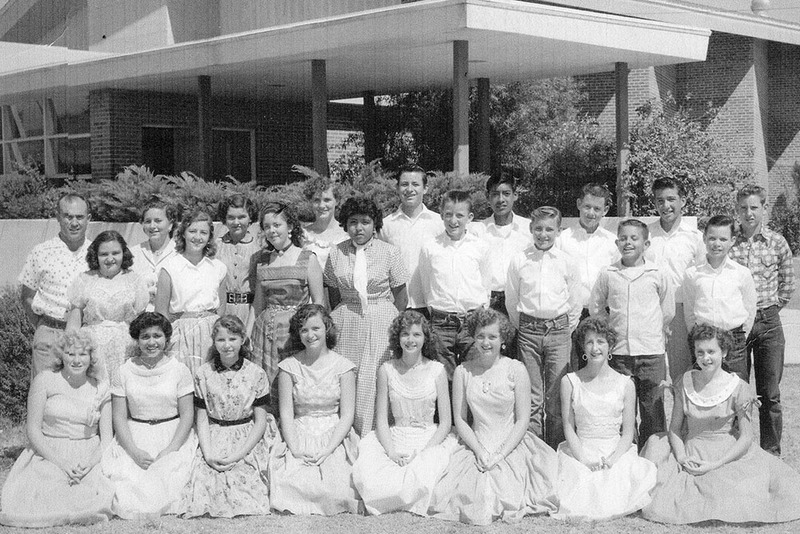 Decades before Maricopa incorporated, the center point of the community was the school. Some of these fresh faces may still be familiar to long-time residents. Front row: Frances Brown, Trini Sanchez, Linda Miller, Roberta Tow, Alice Fay Suiter, Edna Farrell, Rosemary Peters, Kathy Conner. Middle row: Goldie Mullins, Jean Thornhill, Norma Ruth Blackwood, Mollie Norris, Dean Green, Jimmy Matheny, Ray Hernandez, Vern Rhoton. Back row: Harry Goodman, Dorothy Reed, Gerlene Sadler, Carrol Hamon, Billy Tow, Marvin Enos, Craig Cooper, Henry Bandin, Johnny White.